In his monumental research in ancient Sanskrit literature, the author has restored gaps in lexicons, and removed doubts in the later Sanskrit works about the identity of a very large number of birds of the Indian sub-continent. The ancient sages of India were great lovers of nature, with keen powers of observations and an extraordinary sensitivity about animal behaviors. The Vedas, Puranas, Epics and Samhitas are full of descriptions of birds, animals and plants, but the exact identification of names had got lost or confounded over the centuries. Acharya V.M. Apte, the great Sanskrit scholar described this contribution of the author in the following words: "It will be a study-the fascination of which will be matched only by its utility. Scholars intellectually constituted with a purely theoretical bias and studying Nature not in the open but through books, have not a leg to stand on in this field and we will feel highly indebted to a scholar who introduces the ancient (and also modern, because surviving still) Birds in Vedic and Classical Sanskrit Literature to us in such a way as to make us feel that we can actually admire their colourful plumage and appreciate the effusions of their vocal chords." This book fills a void in Sanskrit literature, and should prove useful not only to scholars, but also to researchers who may be inspired by it to delve deeper into Sanskrit texts and ancient Indian culture. K.N. Dave, was born in 1884 in Panna, then a princely State and now in Madhya Pradesh. He had his schooling in Sagar and took the B.Sc. degree from Allahabad; then he taught Chemistry at St. John's College, Agra, simultaneously studying Law. He practised at the Bar, served as a Civil Judge in C.P. and Berar, and later joined the newly created Income Tax Department, retiring as an Assistant Commissioner in 1940. After Independence, he was a Member of the Madhya Pradesh Public Service Commission from 1948 to 1953. Dave had a keen interest in Indian literature since 1904, and in Nature Study from a very early age. Birds and bird behaviors fascinated him ever since he started keeping birds as pets, a hobby he continued throughout his life. 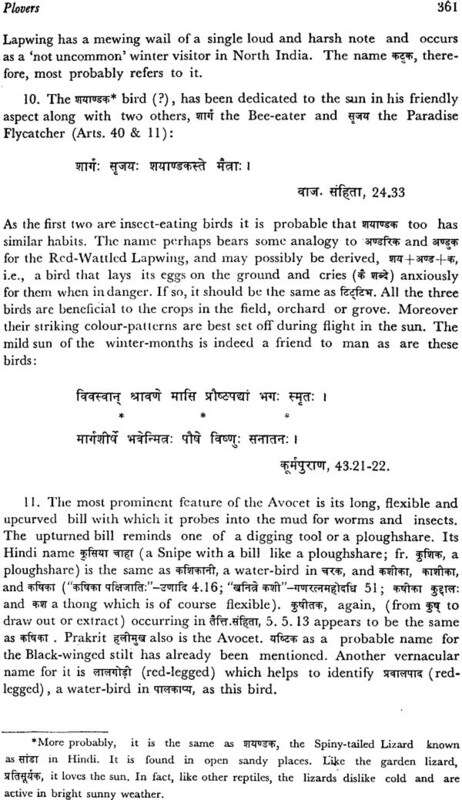 An expert ornithologist, and a scholar of eminence in the Vedas, Puranas and classical Sanskrit works, Dave devoted nearly two decades to systematic research with a view to ture by relating the details of their habitat, coloration and various characteristics to modern scientific observations, and to the names current in Hindi and other languages and dialects of the country. At the time of his death in November, 1983, the author was working on a further major research contribution on "The Mystic Cult of Honeyed Soma and Symbolic Victims of the Veda". It is a matter for deep regret that he could not live to complete that work. However, it is hoped that a brief monograph prepared by him earlier will soon be made available to scholars who may wish to delve deep into the Vedic mysticism uncovered by Dave. "This splendid book is a study of many of the bird names found in Sanskrit literature, from the ancient books of the Rig Veda, and the classical epics of the Mahabharata and the Ramayana to the ancient lore of the Puranas and on through the works of later Sanskrit literature: didactic fables, ethical poetry and then the literature in the Prakrits and Pali. K.N. Dave covers considerable ground and he covers it in a way that will keep the attention of those who enjoy ornithological studies, as well as those who have a general interest in Indian and Eastern literature." 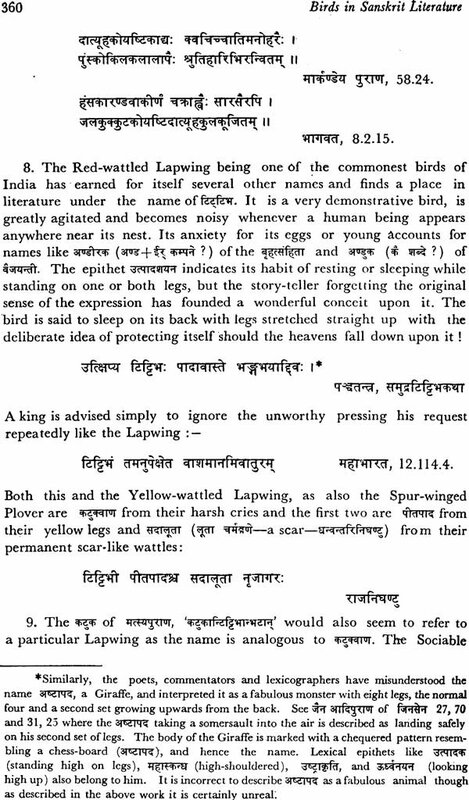 The author clearly scoured the Sanskrit literature for bird references, and this makes the book an excellent starting point for a real ornithologist to tackle the issue, with the help of a translator. As it stands it is useful in understanding how the ancient writers saw and classified birds, but would have been more helpful if the author had made some attempt to date the works to which he refers (though dating texts is a very contentious issue amongst Sanskritists). Too little attention has been paid to the likelihood of names transferring from species to species through time, though the author was clearly aware of the very northern, even outside-Indian, bias of the very earliest writings (the Vedas). Compared to analyses of other ancient texts, notably the Bible and ancient Egyptian material, this book, though substantial, is ornithologically disappointing, but is a mine of fascinating folklore.